hmm..for some reason I didn't really enjoy watching them that much.. even though it was based off the game. Maybe it was because Ling Er was trapped in the Tower and I just wanted Xiao Yao to come save her as oppose to stick around with Ah Qi. Seemed like a pretty forced marriage..I wonder why Ah Qi would agree..and it just seems all too sudden. I sorta forgot, did Ah 7 remember about the Butterfly girl after she saved him? I just don't seem to remember seeing much of his reaction etc when he woke up. Would he cry for her...? um..well, he cried when he was still unconscious.. the moment butterfly girl disappeared..not sure about him getting up though. He didn't love her back anyway..it was unrequited. 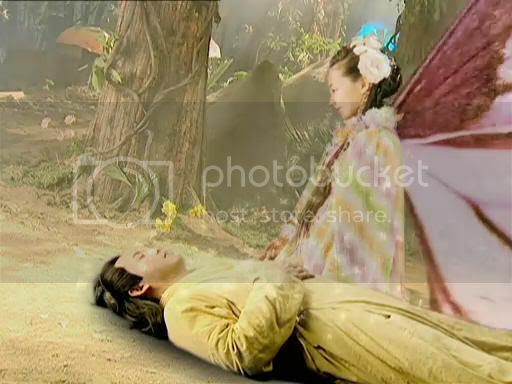 Chibi Jennifer wrote: um..well, he cried when he was still unconscious.. the moment butterfly girl disappeared..not sure about him getting up though. although it's onesided love. it's really pure and beuatiful i think. it's her dedication that touched him. We can understand why Butterfly girl loved him so much, but for AH Qi to agree to marry her so suddenly makes it a bit awkward. I think this part in the drama also reinforces the underlying theme in the series, where there's only one true lover. You can love someone for many reasons, such as in this case, where it was about gratitude. She loves him, but Ah Qi only loves Yue Ru. Yue Ru only loves Xiao Yao. Xiao loves Ling Er, but it could be argued he loved Yue Ru..that's left for the viewer to decide! It's probably better if you don't know what's going to happen so this can be a nice change of pace. For me, when I played the game I know Ling Er is going to die. When I watched the Drama I know Ling Er is going to die. So by that time I'm just watching it for the sake of watching it. purpleGirl wrote: Seemed like a pretty forced marriage..I wonder why Ah Qi would agree..and it just seems all too sudden. I sorta forgot, did Ah 7 remember about the Butterfly girl after she saved him? I just don't seem to remember seeing much of his reaction etc when he woke up. Would he cry for her...? Ah Qi still remembers, he probably knew Cai Yi saved him but he didn't want to ask because that would spoil the intentions of Cai Yi asking Xiao Yao and the others to keep the secret for her. But I recalled seeing a scene where he's sad right after he woke up, somewhere back in his mansion I think. Chibi Jennifer wrote: We can understand why Butterfly girl loved him so much, but for AH Qi to agree to marry her so suddenly makes it a bit awkward. Ah Qi was poisoned because of her, and she wants to take care of him. Remember a scene where he fainted on the streets and she reverted to human form? So probably she brought him back to the mansion, and Ah Qi mother liked her and thus the parents decided on the marriage? Btw, Xiao Yao did love Yue Ru, that was when he lost his memory about his marriage with Ling Er. What I'm guessing is after he lost his memory, Ling Er became a responsibility, but how can anyone not love someone like her.